← Travel. With a Toddler. By myself. It is amazing what you can get done, when you don’t want to do something. That may sound backwards, but it is the truth this weekend. I work full time as a kindergarten teacher. My students are hilarious, I am always busy, and my classroom is a giant mess. My husband has his dream job, and it has its pros and cons for me. A major upside is his two months of downtime where he works from home mostly, does some in the office work and only travels a little bit. Those two months just came to a close. Then there is the beginning of the busy season for him, where he actually lives in another state for work. My husband is amazing in many ways, but the one that most of my girlfriends are jealous of is his domestic prowess. He loves to cook, and it shows (tastes), he keeps the house clean (sometimes close to Monk-clean) and does all of the shopping, weekly. I’m not kidding. (I used to joke that I have a house-wife in the ‘50s, but I got too many resentful stares because, I’m guessing, they do not.) During the last two months, this was definitely the case. Then came this month. I am embarrassed to admit that I have done more around the house this last weekend, than I have since October. I have done two loads of towels, two loads of sheets, two loads of clothes. Washed, dried and put away (at time of posting, this is a slight exaggeration-one load is waiting to be dried, one waiting to be put away.) I vacuumed the carpets (Luke helped a bit, until we hit the edge of the rug and that shocking shuddering noise terrified the bejeezus out of him), dusted/mopped our floors, and did a load of dishes (and put them away-always the kicker for me). I pulled the spider-infested sheets off of the front patio railing (yes they’ve been there since we pulled ripped the tree out of the house in January). 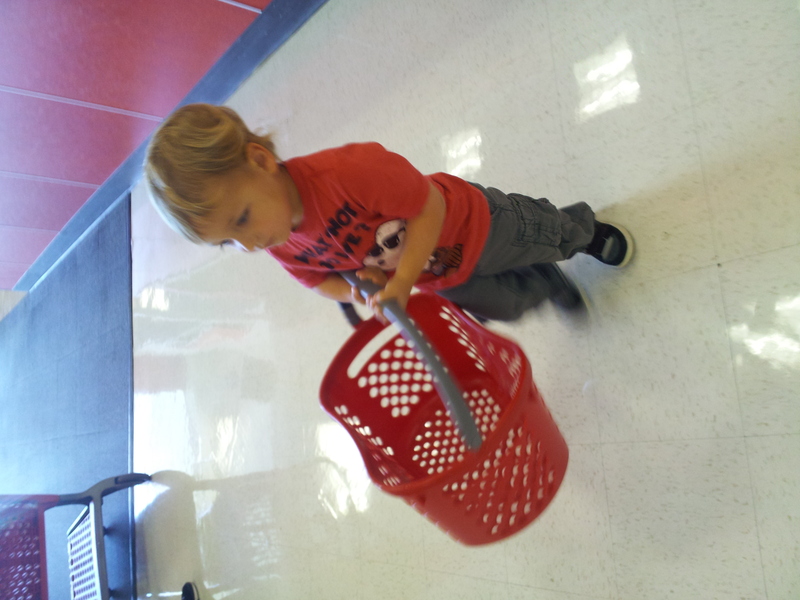 I went to the grocery store without Luke, and went to Target with Luke. (Side note-Luke came home with the least expensive item from Target that he has ever requested-Surfer Ken! He comes complete with turquoise sunglasses and matching board shorts, a shark’s tooth necklace, blonde surfer hair and great abs.) I created a surfboard for Ken out of an old take out box for Luke to use in the bathtub, because Surfing Ken can go in the bath! I went through Luke’s clothes and packed away his outgrown ones. I went through the refrigerator and took out all of the trash. I made a quiche! And baked chocolate chip banana muffins with my overripe bananas. I cleaned the stove, kitchen sink and counters. I dismantled, de-slimed and de-slugged the sand and water table that has been sitting on our patio and collecting nature since August, and packed it into the car. (Don’t worry Bubby and Papa, Luke is loaning it to Miriam’s Day Care and will have a much greater chance of using it there!) We had a mini date night Friday, just the two of us, had Uncle Aaron over for dinner on Saturday and joined my cousins Kelly and Matt for a lunch date today! I feel so productive and yet so lazy at the same time (just thinking about how much I haven’t done before this weekend!) And it made me think, why this weekend? It can’t be just because Brian is out of town. This most definitely DID NOT happen the last time he was away, nor the time before, nor the time before that…you see where I’m going with this. And then, as I was pruning the rose bush/tree that was planted before we moved into this house, that I have NEVER pruned by the way, I am suddenly stunned by the reason behind all of my productivity. So I decided to write a post and watch the Oscars. This entry was posted in date night, housekeeping and tagged Dyson, Ken, procrastination, productivity, Target. Bookmark the permalink. I almost thought you were going to say you were nesting… but I guess you would mention something like that in person. (I’m not trying to start any rumors.) No wonder we couldn’t connect via tele. You’re probably awake now, but finally, after my procrastinating watching the Oscar After Parties and playing on Pinterest, I’m off to bed. If you find out that I’m pregnant (which I’m not) on a blog, you have my permission to disown me as a friend. 🙂 No worries there. As I was writing it, though, I wondered whether someone would think that too.